Well hello there! it has been a while, hasn’t it? how are you? The last few months my partner and I have been finishing up our home renovations and putting our own little stamp on it. It has taken us every spare second and I am so happy the end is now in sight. I do apologise for neglecting you guys for a few months! I just thought I would pop on quickly, let you all know that I am ok and leave you with a few decor crafts I have created over the last few weeks. We now have blackout blinds in all our bedrooms, they are very practical but not very aesthetically pleasing, so we hung white drapes over the top of them to help soften the window area. The pom poms I sewed around the bottom of a wide piece of satin ribbon. I attached a button to one end and popped a hole in the other to fasten together. I love the pop of colour they bring to the room. I created these for our playroom and spare bedrooms because they are perfect to display photos, drawings, certificates and they can be changed super quickly. They would be great for use in children’s bedrooms, nurseries, childminders and schools! I bought plain basic frames from B & M in a variety of sizes. I chose to buy them all in white but they did have blue, red, yellow and black available too and they were very reasonably priced, I was very surprised. I removed the glass and backing board and laid the frames out on a flat surface, I played around with them, until I got a layout that I was happy with. Then using a strong wood glue, I glued the frames together and glued small silver pegs (from Coleman’s) at the top of each frame. I made three sets, all with 8 frames included in each, which worked out to be 24 frames for around £18! 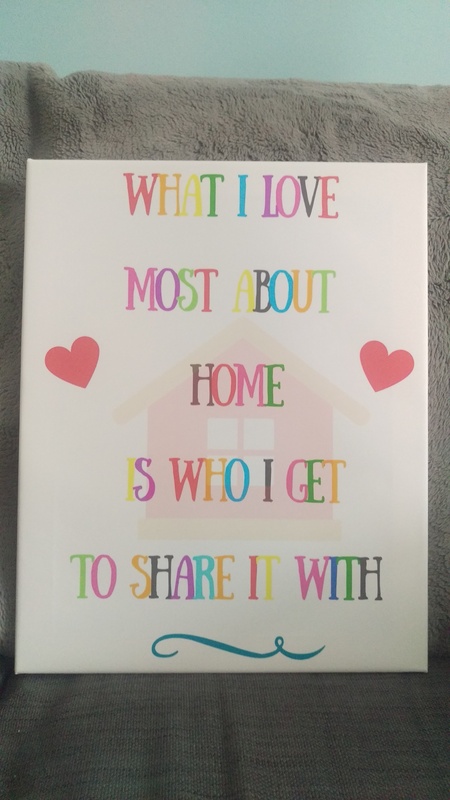 A few years ago I bought a tiny frame from Primark which read “What I love most about my home is who I get to share it with” – I have had it on my dressing table and I have looked at it every morning and the saying is most definitely true! – I have been planning for a long time to have it blown up in to a larger poster, but after a little research, I found this wasn’t a cheap option. Until I stumbled on an ebay listing that personalises canvas prints to whatever size your heart desires. >link here< – I designed my own artwork using Canva.com – made my purchase through ebay and sent off my graphic to be printed on an A2 size canvas. I am over the moon with it. It is exactly what I wanted. It will definitely brighten up our hallway and all for only £9.34 with free p&p. I have struggled for a while to think of what to do with our downstairs WC. I wanted to do something a little different but I had no idea what! how on earth do you make a toilet room more interesting?……..then it hit me, how about adding some laughter! Barry and I both enjoy attending comedy gigs, we watch a lot of comedians on TV and Barry is always working on his pun delivery, so this seemed like a fun theme to have in the loo. This isn’t toilet humour in the general sense of the meaning because we have a lot of children that visit our home. Instead I created a collage of some of our favourite comedy lines, funny quotes and jokes that tickled us, printed them out on two A4 size papers and popped them in a frame that I bought from B & M. What I love the most about this, is that it can be changed really easily. Maybe at Christmas we will have a Festive pun theme! I also then added some light reading materials on the window sill, which helped to brighten everything up! – this is one of my favourite little corners of our home now. That is that, 5 simple DIY’s that I have enjoyed creating over the last few weeks. I hope you liked me sharing them with you. If you would like a more detailed guide on any of the crafts, please leave a comment below and I will write them up with step by step instructions and photos. Lots of love to you all for now. Previous Dear Lady in the Car Park…. Next Dog Friendly Cupcakes | Puppy’s 1st Birthday! I love the tiolet humour! I recognise many of those quotes!